I know I’m in good health. My blood pressure is always great. I’ve never struggled with diabetes or high cholesterol – but I’m fat. Call a spade, a spade, ya’ll. I am a curvaceous mama. It took a long time for me to just accept the fact that I am never going to weigh 130 pounds. I won’t. I never have. And that’s okay. Health shouldn’t be defined solely by weight alone. I made a decision that I needed to love myself and to do that I needed to put my health first rather than try and achieve a number on a scale. If I changed my lifestyle, weight-loss would come with it. In fact, I have been gaining weight – and not because I’m eating food filled with crap. On the contrary – I eat vegetarian, drink tons of water and work out fairly regularly. Despite that, I was still gaining. 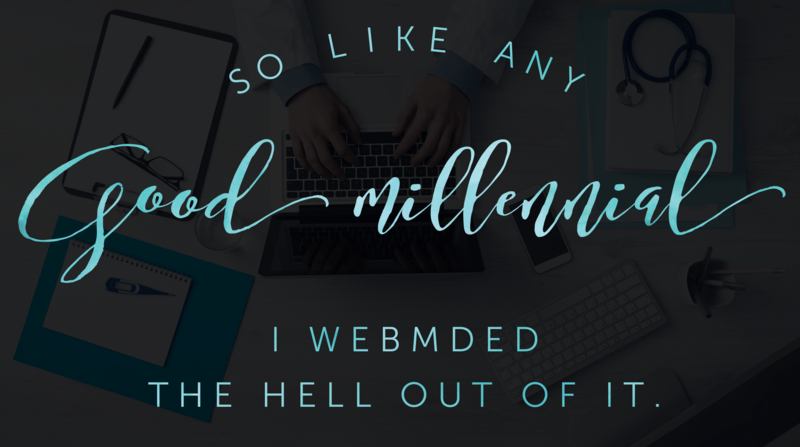 Not to mention that there were a multitude of other things going on health wise that just weren’t like me – foggy brain, super fatigued, etc. I figured my thyroid was probably out of whack and there was probably some type of vitamin b or d deficiency. I’m not a medical professional, but I’m not an idiot either. I did my research. That, coupled with the fact that the doctor had palpated my thyroid at a previous appointment, made a funny face said, “eh, I think it’s okay right now, we will check it later” so I said, “eh, it’s probably okay” and then did nothing about it, led me to believe this was probably the culprit. Fast forward to last Tuesday – at my annual physical. The doctor had my previous-palpated-thyroid-notes in the chart that said, “this is a concern to be checked,” so please keep that in mind. The doctor pondered on this for a split second, barely taking in what I was saying to him. This, ladies and gentleman, is where I lost my humanity and became a number on a scale. Where I became “less than“. To see how Ashley reacted to her doctor’s interrogation, the results of her tests, and her final stance on the matter, check out her original post over on The Witty Bean. Ashley Price is a lifestyle blogger with an affinity for well-made drinks, sarcasm and a good red lipstick. She and her husband Sean moved from Arkansas to North Carolina two years ago and along the wild ride, haven’t looked back! With their three boys, two family dogs, and her witty personality, there is never a short supply of ‘WTF? !’ moments in their lives. Ashely’s world is full of love, honesty, and hot coffee so join in as she makes others laugh and sometimes cry – all while sharing her journey through writing, motherhood, and dream chasing.